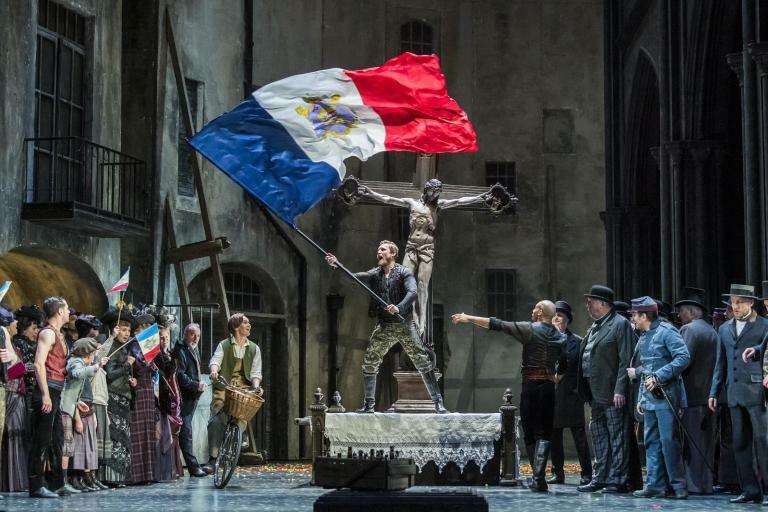 With its annual gala, Stars of Lyric Opera at Millennium Park, Lyric Opera of Chicago joyously inaugurated the 2018–2019 season. Conducted by Domingo Hindoyan, the program featured works from this year’s repertoire, as well as upcoming soloists, and members and alumni of the Ryan Opera Center for young artists. J’nai Bridges (filling in for an indisposed Elizabeth DeShong) gave an exemplary reading of ‘Mon coeur s’ouvre à ta vois’ from Saint-Saëns’s Samson et Dalila. Ms. Bridges was technically precise and emotionally charged, capturing the score’s sensuality. Her rich, deep mezzo was even throughout, in all parts of her register, coupled with elegance and assurance — a performance of consummate style. Baritone Zachary Nelson offered a similar account of Renato’s scena ‘Alzati…Eri tu’ from Verdi’s Un ballo in maschera. Nelson’s suave approach made Renato’s angry jealousy come to life. When the music returns to the anger that precipitates his decision to kill Gustavo, Nelson captured the essence of the drama. Nelson is part of the cast of the new production of Puccini’s La bohème, the focus of the second half. A scene between Mimì and Rodolfo was effective, with soprano Maria Agresta and tenor Michael Fabiano. Fabiano’s stage presence and subtle movement skillfully brought the audience into the scene, to suggest a Parisian garret. The pacing of the familiar ‘Che gelida manina’ gave a sense of conversation, and Agresta responded with her well-considered eye contact and body language to suggest Mimì’s caution. ‘Mi chiamano Mimì’ benefited from Agresta’s subtle inflections, and both she and Fabiano built the scene with increasingly intense rhythms and volume. Conductor Hindoyan moved directly to the entire second act, in which Fabiano and Agresta were joined by Nelson (Marcello), Ricardo José Rivera (Schaunard), Adrian Sámpetrean (Colline), Mario Rojas (Parpignol), Jake Gardner (Alcindoro), and Danielle de Niese (Musetta), along with members of the Lyric Opera Chorus and the Chicago Children’s Chorus — all in a vivid reading that showed Hindoyan’s deft hand. The men’s ensemble work was particularly strong. De Niese’s strategically flamboyant approach to Musetta gave the reading a dramatic edge, which culminated in her character’s signature aria. At times the balances seemed strained, which can happen when the orchestra is on stage, rather than in the pit. But in general Hindoyan brought things together with exceptional timing and rhythmic precision. To complete this well-chosen sampler came the choral scene ‘Placide é il mar’ from Mozart’s Idomeneo. Chorus master Michael Black elicited reliable balance and well-voiced textures from the ensemble. Here, Ann Toomey gave a spectacular reading as Electra, with precise rhythms and elegant lines. This exquisite part of the evening gave the audience an all-too-brief taste of the new production they will encounter later in the year. All in all, this preview gave the open-air audience at Millennium Park an aural invitation to the glorious season ahead, as well as the voices that will be part of it. As Lyric’s general director Antony Freud added in his comments from the stage, the season offers a particularly diverse selection of music, as well as special programs for the community.